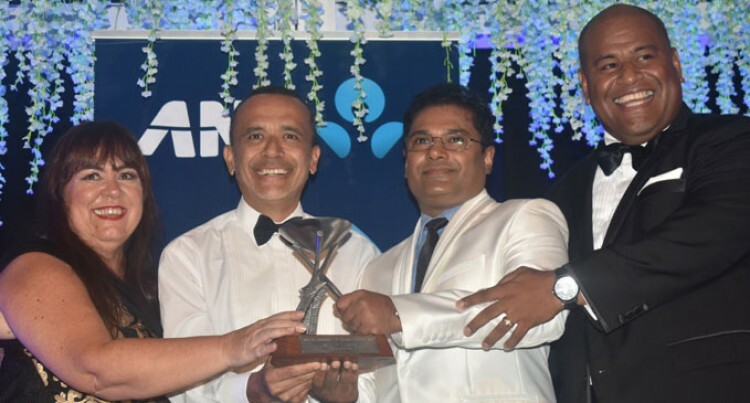 Brigid Whitton, Rosie Group managing director Tony Whitton, general manager finance Tappoo Group Sumith Perera, and Rosie Group general manager Eroni Puamau as Rosie Holidays receive the Destination Marketing award at the 2017 ANZ Fiji Excellence in Tourism Awards at the Denarau Convention Centre on February 17, 2018. Photo: Waisea Nasokia. Rosie’s Group managing director Tony Whitton was overwhelmed with their Likuliku Lagoon Resort being the first to be inducted into the Fiji Excellence in Tourism Awards Hall of Fame. Likuliku, on Malolo Island in the Mamanucas, had won the Fiji Excellence in Tourism Luxury Resort award five years in a row. Mr Whitton said: “It is a story of a Fijian family resort that has the ability to be able to hold its own in terms of the global arena and to be able to hold its own in terms of Fiji with the international brands that we have. “And we have wonderful resorts in Fiji. “But tonight is a wonderful testimony of what we can do with the Fijian spirit. “Fijians have the ability to excel in the global arena like all the international branded hotels that we have and Fijians have the capacity to run the best resorts in the entire globe. “With the awards that we have received and to be able to be recognized here with the trustees of the ANZ Fiji Excellence in Tourism Awards shows a wonderful story to any budding Fijian or small business operator. “You can create truly something extraordinary something world class and not to have a small view of something you can do. “So this is an award about Fiji entrepreneurship, this is an award about Fijian small businesses and this is an award on a wonderful story about how we can build with the wonderful people and how our wonderful Fiji staffs can offer the best services world and the best resort in Fiji,” said Mr Whitton.